Safe treatments for eczema are scarce– a fact experts and sufferers have long lamented. 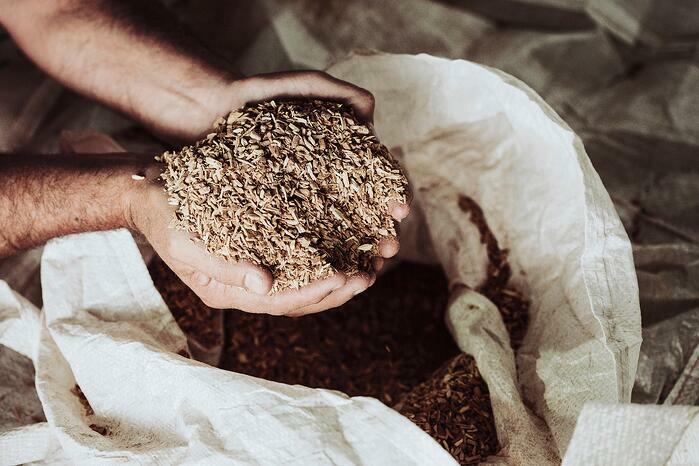 But wellbeing super-ingredient Sandalwood Album – now the subject of Phase 2 clinical trials to create prescription drugs -offers exciting breakthroughs in this frustrating skin condition. While Baburek and her husband had escaped the effects of the infamous San Antonio ‘mountain cedar tsunami’ – a period when plumes of pollen aggravate allergies with a particular fury and dependability -Ryan hadn’t been so lucky. Ryan – along with 31.6 million Americans – has eczema, a form of atopic dermatitis characterised by parched red skin, and a pervasive itching oozing rash. Though its exact causes are unknown, the disease is driven by a mis-regulated immune system that is mistakenly stimulated to attack the skin. To date, there has been no safe and effective treatment. Rushing Ryan to an urgent care clinic, Baburek was prescribed two allergy medications, an anti-inflammatory liquid and a high-potency steroid cream. She balked: “I know what steroid creams do to your skin, and if that’s your only option for a two-year-old… Well, that’s pretty scary,” she says. The anti-inflammatory cream and allergy medications had some effect on Ryan’s swelling but her cheeks were still “fire engine red” and her body scabbed and painfully itchy. After 2 days of seeming minimal, if any, effect from the prescriptions (she refused to use the steroid cream), Baburek went to my cupboard for the Sandalwood Album cream left over from her older daughter’s diaper rash – also an inflammatory condition. Thinking, ‘why not?’, she massaged some onto Ryan’s body before putting her down for her afternoon nap. “When she woke up, her cheeks weren’t red anymore and she wasn’t scratching,” she says. “The next day her skin had almost completely normalised, with just a few patches that had been particularly nasty.” Ten days later, it was completely clear – and has yet to return. 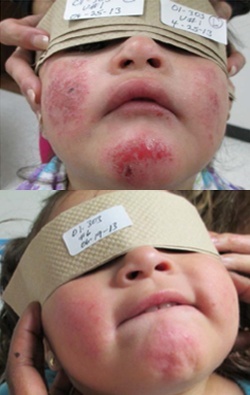 Eczema usually first appears in childhood, with the condition displayed in over one in ten US children. External factors like airborne pollen, low humidity, and certain skincare products can aggravate the disease. But more often, it appears for no reason at all – and effective treatments can be just as elusive. In 2010, Dr Browning was approached by biopharmaceutical company Santalis – a subsidiary of Quintis - to develop prescription skincare using Australian-grown Sandalwood Album. Long used in Ayurvedic and Western medicines, recent research has begun to shed light on the mechanisms by which the oil exerts it’s biological activities. Reviewing the data on sandalwood oil’s anti-inflammatory, anti-bacterial and anti-viral properties, “I thought it would be a really great treatment modality for atopic dermatitis,” he says. Over eight weeks, he led a clinical trial: 32 children with mild, moderate and severe eczema soaked in a Sandalwood Album cleanser bubble bath and moisturized with a Sandalwood Album based moisturizer. At the end, they reported a 68% reduction in severity – a result comparable to steroid creams, with fewer risks. 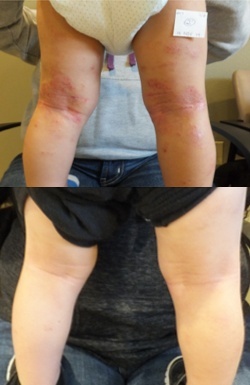 In a study of 32 children with eczema, 68% reported a reduction in severity – a result comparable to steroid creams, with none of the risks. Nurtured in Australia’s pristine north, and made according to Good Manufacturing Practices (ICH Q7), Quintis Sandalwood Album oil is the world’s only pharmaceutical-grade sandalwood. Today the oil is part of five clinical trials to develop prescription drugs that harness the oil’s potency, including a larger Phase 2 clinical trial for eczema. By using state of the art genetic analysis, Quintis is beginning to uncover and confirm the impressive therapeutic properties of Sandalwood Album. Using this technology, wich draws on the genetic profile of 350,000 clinical subjects, psoriasis, oral mucositis and eczema have been identified as having strong likelihood for clinical success scoring highly in the database’s predictive algorithm. For parents like Baburek, this is a welcome relief. “You’re dealing with sensitive skin on a very sensitive little person. I’m so glad there’s an alternative,” she says. * Full disclosure: Baburek is associated with Santalis, but this is her true story. Given the FDA’s strict regulations regarding patient confidentiality, we were unable to directly reach out to the patients from the study.